Creating a dedicated reading spot sounds like a fabulous idea to us. After all, getting lost in a good book is a favoured pastime for many of us. Whether you’re seeking to escape the stresses of daily life, are keen to expand your knowledge, or want to keep your imagination alive, like all avid readers you’re likely to have an appreciation for a great reading spot. This collection of reading spots will make you want to drop everything, grab your favourite book and hunker down for a day of reading. From airy outdoor spaces to cosy armchairs complete with open fires, there’s guaranteed to be something for everyone. Inspired to design your living room from scratch to make space for a reading spot? Find out how in our guide. You can create an atmospheric, alluring reading spot by lining your shelves with antique tomes picked up at fairs and specialist shops. Complete the look with an array of finds, including accessories and artwork. Dan Cruickshank's Georgian home (above) is the closest you’ll get to a real-life fantasy world. Filled with a vast collection of intriguing antiques and one-off pieces, this truly unique home has the power to bring the magic of fairy tales to life. Windows are often unexploited, with seating placed facing away from the view and into the room. So why not create a window seat that's designed with nothing other than a morning read while taking in the view (and exploiting the natural daylight) in mind? Filled with cushions, they are an inviting design feature in the home of every book lover. Continue exploring Simon Fenwick’s restoration (above) of the unloved Grade II-listed Elm House into a beautiful, traditional country home. The ideal reading spot will be TV-free, perhaps even radio-free, and most definitely smart assistant-free. That way, it's more likely that you and your family will settle down for an uninterrupted delve into your favourite books. The simple design and airy feel of this living room (above) makes it the ideal distraction-free spot. Plus it has a gorgeously lit window-seat which is just perfect for curling up in a cosy blanket and immersing yourself in a page-turner. Discover more beautiful design features inside this restored Arts and Crafts home. Find more serene white living room design ideas in our gallery. There is nothing quite like snuggling down under blankets with a good book in hand and the fire roaring while the snow falls outside. But to make the experience really work, you'll need to ensure you invest in the best sofa. We think these gorgeous velvet sofas would lure us in. 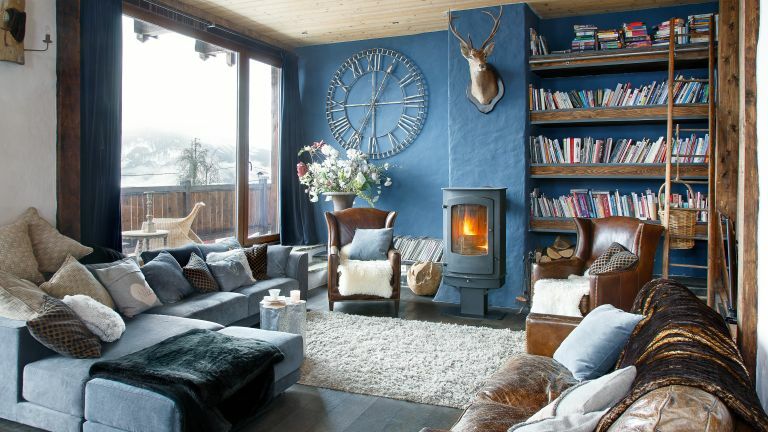 Explore the rest of Nikki and Hugh Quinn's beautiful chalet hideaway (above), which is nestled in the French Alps. A wall crammed full with books is any reader's dream, so consider whether you could devote an entire side of one room to your book collection. The more cluttered the shelving, the more charmingly eccentric it will look. Take a look at Urban and Lara’s home (above), which is filled with intriguing collections. Check out our favourite book storage ideas, too. Just as white walls and furnishings will create a bright, light reading spot, using deeper, cooler shades will make for a serene space that's perfect for settling down with a book. Here, the book shelves have been neatly blended with the grey walls, while the books on display are colour co-ordinated in inspiring blues and greens – perfect for inviting a book lover to settle down with a good read. If your home has a large open plan kitchen diner and living space, it's likely that there's plenty of room to place a comfortable armchair right next to a shelf full of books. Ideally, place an occasional table and reading lamp close by to encourage evening reading, too. We've found the best armchairs for cosy living spaces; don't miss our guide to creating an open plan kitchen diner and living space, too. We'd all love our children to read more, right? Thick duvets, plump cushions and beautiful bed frames combine to create a space that’s perfect for bedtime stories, family bonding and the opportunity to introduce your child to a lifetime enriched by the power of imagination. And, once you've bred that love, and created a bedroom that really encourages reading – perhaps with good storage for children's books near the bed – they'll continue the habit on their own. It’s not just Alison Lewis' children's bedroom that’s cute and cosy – take a peek at the rest of her cottage. For those who love the garden just as much as they love reading, this gorgeous summerhouse is a fabulous addition to any bookworm’s plot. It offers the serenity that accompanies a beautiful garden, with some protection from the unpredictable British weather, making it a year-round getaway. Take a look around the rest of Gay and David Engledow's incredible garden, and don't miss the chance to browse these beautiful summerhouses to inspire your own project. You needn't create a reading spot in a room surrounded by books – or even indoors. Why not take a step into the world of The Secret Garden’s Mary Lennox or Anne of Green Gables and settle down in a real life secret garden? This bench is hidden in a gorgeous flowering meadow; ideal for letting yourself get lost in the sunshine for an hour or maybe two. Continue to be inspired by Ben and Mark Hamilton Anderson's quirky cottage renovation; find out how to grow a cottage garden, too.